Your turnkey provider of Specialised Exhibition Platforms. Your ultimate face-to-face marketing tool. Make your best first impression in the very competitive world of exhibitions. It is absolutely imperative that your exhibition stand works hard on your behalf, effectively portraying your brand and clearly communicating your products and services in an innovative effective manner. We are all design professionals and take great pride in what we do. We deliver nothing less than the exceptional. The Exhibitionist has extensive experience in custom/modular displays and project management, being involved from initial client briefing to client hand-over. Our particular strengths are in design, people and time management, ensuring that a project is completed on time, in budget and with the development of continued client relationships. Your allocated design professional will be with you every step of the way. We aim to make your exhibiting experience as stress-free as possible. The Exhibitionist holds stock of aluminum system and furniture in Johannesburg, Cape Town and Durban. Custom carpentry is produced in-house and withpartners to ensure we deliver whatever it takes. We are also currently bringing in both vinyl and fabric printing internally. The Exhibitionist focuses on the design, build and manufacturing of exhibition stands, displays, shop fittings, retail stores, stages, displays and commercial interior design, as well as corporate events (with our in-house events team). Our team has extensive experience in custom/modular displays and project management, being involved from initial client briefing to client hand-over. We aim to continuously improve our skills and better our service and product. We strive to always exceed our customer’s expectations. Particular strengths are in people and time management, ensuring that a project is completed on time, in budget and with the development of continued client relationships. Your allocated design professional will be with you every step of the way. Jennifer Gibson started The Exhibitionist in 2008. Jennifer, a qualified Interior designer, got involved in Exhibition Design in 2005, she worked in the UK in 2006/07. Since opening in 2008 we have grown the company substantially. We have established strong alliances around the country to facilitate national work, meaning we can easily work around South Africa in particular Johannesburg, Durban and Cape Town. 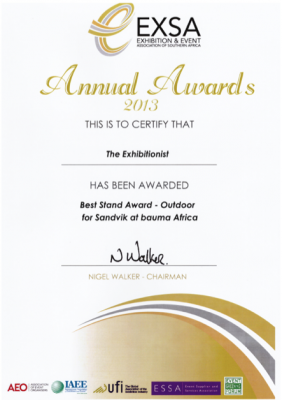 The Exhibitionist holds System Aluminium stock in both JHB and CT. All our system stands are constructed internally. The Exhibitionist has a very strong alliance with a few select, well established, experienced carpentry companies that construct all our custom stands. Having a number of preferred carpenters increases our capacity as we are able to spread teams and not over commit. 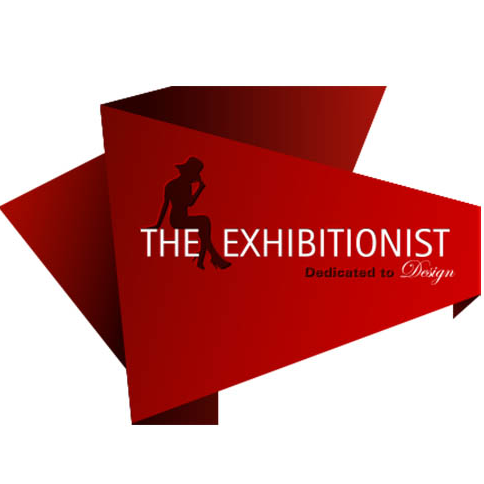 The Exhibitionist focuses on the design, build and manufacturing of exhibition stands, displays, shop fittings, retail stores, stages, displays and commercial interior design. We are all design/marketing professionals and take great pride in what we do and deliver nothing less than the exceptional. The Exhibitionist has extensive experience in custom/modular displays and project management, being involved from initial client briefing to client hand-over. Particular strengths are in people and time management, ensuring that a project is completed on time, in budget and with the development of continued client relationships. Your allocated design professional will be with you every step of the way. We would like to make your exhibiting experience as stress-free as possible. The Exhibitionist is focused on the design, build and manufacturing of bespoke Exhibition platforms. We can actualize your ideas and we will project your brand effectively and display your products and services in an intriguing and exciting way. We present innovative, fresh ideas in our designs. We provide 3D computer generated illustrations, which enables our clients to visualise their proposed concept clearly. When presented, the client has the opportunity to suggest and require changes. 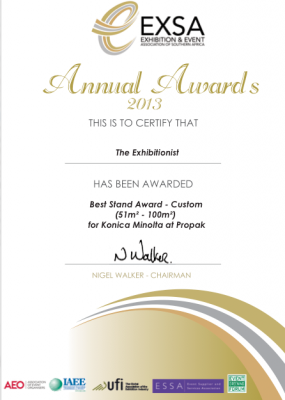 Choose from the Standard Stand Packages or let us design something new according to your budget. A flexible, modular system, developed for its ease and range of assembly. The system allows for diverse, intricate designs through its modular nature and ability to house various materials such as, fabric, timber, graphic panels, light boxes and aluminium. Taking an existing shell scheme package and cladding it with fabric graphics to conceal the aluminium uprights and white boards. This is the most cost effective means of achieving maximum visual impact, setting yourself apart from the rest of the shell scheme booths. This can be achieved by tensioning fabric to the existing shell frame supplied by the organisers. The Exhibitionist caters from the experienced exhibitor to a first time exhibitor. We are the design professionals who will step you through the process carefully to make sure you optimize your exhibiting results. We will make your first impression be a lasting one.